Mina Cheon (PhD, MFA) is a Korean-American global new media artist, scholar, and educator who divides her time between Korea and the United States. 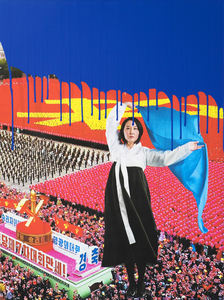 Cheon has exhibited her political pop art known as “Polipop” internationally and draws inspiration from global media and popular culture to produce work that intersects politics and pop art in subversive and provocative ways. In particular, Cheon has worked on North Korean awareness and global peace projects since 2004 and appeared to the world as a North Korean artist KIM IL SOON since 2013. While she creates work that range in medium from new media, video, installation, performance, and public projects to traditional media of painting and sculptures, the content of the work is in historic alignment to appropriation art and global activism art. Just as the Korean peninsula is split, so is its contemporary artistic consciousness. 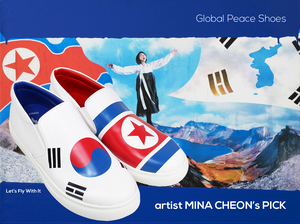 Mina Cheon is a South Korean artist who collaborates with her North Korean alter-ego KIM IL SOON (a Socialist Realist painter, naval commander, farmer, scholar, teacher, mother, and human being). In this, the latest of Cheon’s grapplings with the Korean schizo-imaginary, the topics of art, motherhood, games and hope come together in a reflection upon (cult)ure, love and education. Mina Cheon lives and works in Baltimore, Maryland. Inaugural artist for RE/PUBLIC, architecture firm with a gallery invites Mina Cheon, February 4 – April 20. Happy North Korean Children, The Trunk Gallery, Seoul, Korea. June 26 – July 29. Choco·Pie Propaganda: From North Korea with Love, Ethan Cohen New York Gallery, New York. January 23 – March 1. Light City Baltimore, art commission from the Mayor’s Office and the Baltimore Office of Promotion & the Arts, for “Diamonds Light Baltimore,” in collaboration with architect Gabriel Kroiz, to install 15 diamond shaped LED light sculpture installed at Pier Five during Light City festival, Spring 2016. Face to Face, curated by Ethan Cohen, Ethan Cohen New York gallery, NY, September 10 – October 24. Double Mirror: Korean-American Artists, curated by Iris Inhee Moon, American University Museum at the Katzen Arts Center, Washington DC, April 1 – June 1. Includes Eat Choco·Pie Together installation and Kim Il Soon paintings Happy North Korean Little Boy and Happy North Korean Little Girl. “Korean-American New York Film Festival’s visual arts exhibition,” at Sylvia Wald and Po Kim Art Gallery, artistic director Susie Lim, curated by Hyejung Jang, New York, NY, October 15 – October 31. Includes Dokdo, video installation, piece extended with collaboration on sculptural installation with Nara Park. Desirable Fantasies: Between Fantasy and Reality, Korus House, The Korean Embassy in US, curator Jeon Jeong-ok, Project Andini initiative, group exhibition with Cheon, Hye Rim Lee, Gilbert Trent, Satomi Shirai, Washington DC. The Art in Embassy Program, group exhibition of Korean-American artists including Mina Cheon, Nam June Paik, Byron Kim, Doho Suh, and Nikki Lee, American Embassy in Seoul, Korea. media in’f’ – 5th EMAP: Ewha Media Art Presentation, section “Looped in America,” curated by Inhee Iris Moon, Ewha Art Center, Ewha Women’s University, Seoul, Korea. Entropy: Arrow of Time, part of "The Flow of New Tendencies in Korean Art," curated by Kim HeyKyong, Fine Arts Center of Korean Culture and Arts Foundation, Seoul, Korea. Maryland State Arts Council Individual Artist Grant for Painting as Kim Il Soon, on North Korean painting series. MICA Faculty Research Grant on projects related to North Korea, research done in Seoul libraries on North Korean publications, and production of artwork done in K-Town Studios in Baltimore for next solo exhibition. Photo It artist, archival print support for “Happy North Korean Children” exhibition at Trunk Gallery, Seoul, Korea. Includes a feature published in Photo Dot cultural magazine, July issue, Seoul, Korea. 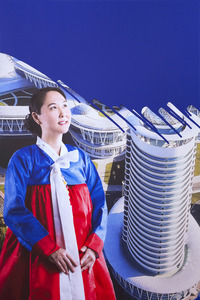 18 Best Korean Artists of 2012 Sovereign Asian Art Prize Hong Kong, nominator Hyunjin Kim, exhibition and charity auction at Seoul Auction, Seoul, Korea, March 14-20. MLK Unity Week Award for diversity efforts on campus and beyond, Falvey Hall, Brown Center, MICA, Baltimore, MD, January 20. Includes a keynote address “On Racism” dedicated to Flores McGarrell. Research Initiation Grant, MICA, cultural comparative research between Korean and Japanese popular culture, specifically “Kenkanryu: The Korea Hate Wave” that deals with the subject of images of hatred and racism in popular culture of Asia tied to global media. European Graduate School (EGS) awarding publication of Shamanism and Cyberspace, Atropos Press: Publisher of Thinking, Dresden and New York.